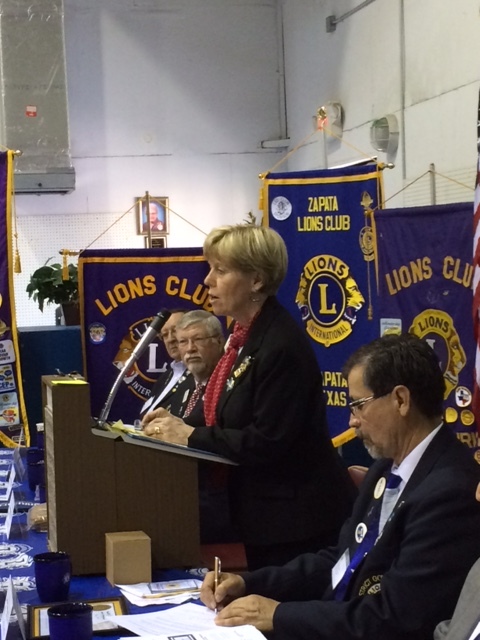 At long last, Lion Kathy and I were invited to a Lions event in Texas! 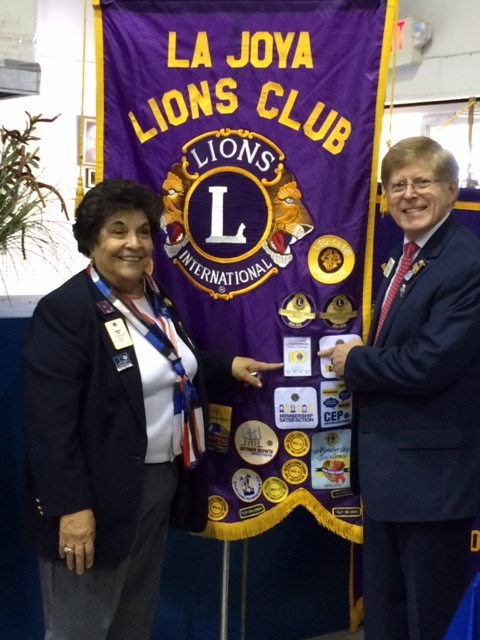 We were so pleased to be the guests of District Governor Juan Lopez and the Lions of District 2-A3. The mid-winter conference was held in Rockport, just north of Corpus Christi. When we landed in Corpus Christi, Past District Governor Mike Olszewski met us and immediately directed us to a Texas barbecue restaurant that served up a terrific meal to start our visit. 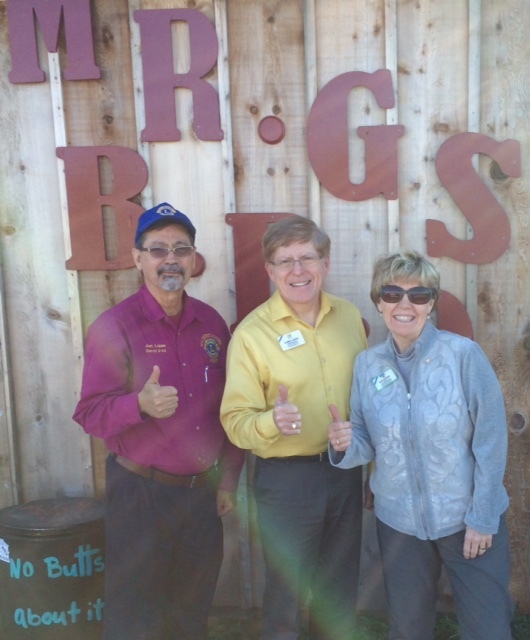 DG Juan, ID Robert, and Lion Kathy at Mr. G’s B-B-Q! 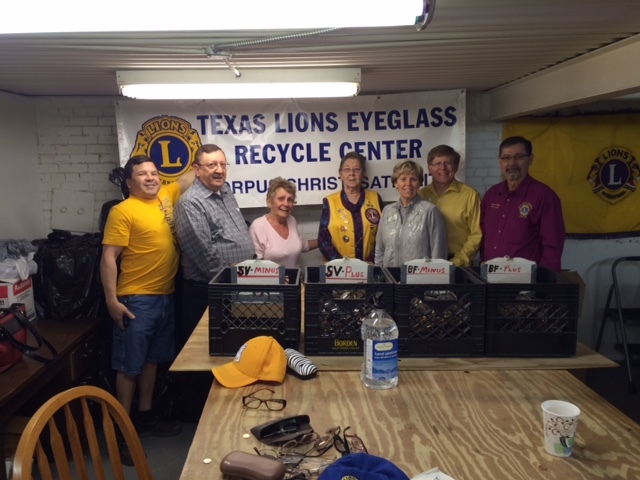 DG Juan wanted us to see some hands on projects being conducted by Lions in the area, so we started at the Eye Glasses Recycling Center—Corpus Christi Satellite. 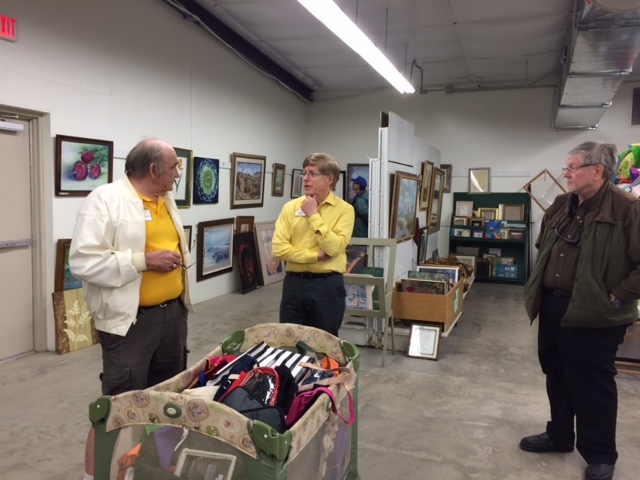 Lion Zelma (third from left) and Lion Pat (middle) provided a tour a demonstration of the Recycle Center. There, Lion Zelma Champion and Lion Pat Olszewski gave a tour of the facility and demonstrated the equipment they used to screen the glasses. They were very proud to report that LCIF had matched funds raised locally—$5,000—to provide four new lensometers to read the prescriptions on the donated glasses. The center processes thousands of glasses monthly and they are sent with volunteers on mission trips. We were pleased that both Lion Zelma and Lion Pat later received Presidential Certificates of Appreciation for their service. 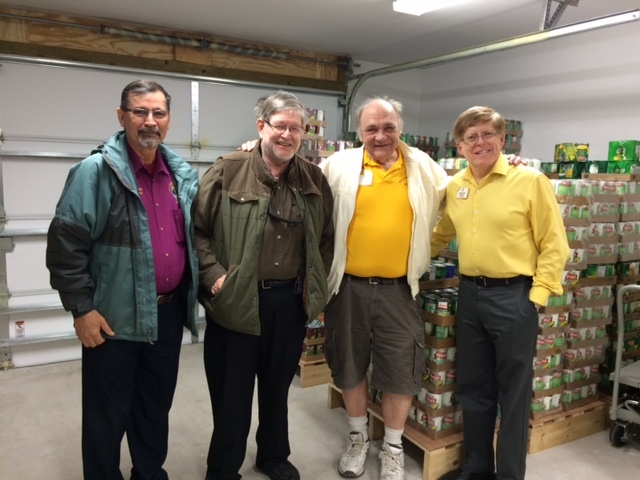 DG Juan, two members of the Lockport Lions Club, brought Kathy and me to the Food Pantry. Lion Russ explains the success of Castaways as a fundraiser for local charities and church groups. When we arrived in Rockport, we visited the Food Bank, the Castaways (a thrift store that looked like a shopping center) and “Coastal Bend Troop Support”—a veterans support center—all staffed by local Lions and providing service to large numbers of people in need. Kathy and I were so impressed with the commitment and efforts expended in these projects. Certainly the Lions of District 2-A3 can be proud of their service. After getting settled in, we met many of the Lions at a reception held to welcome us to the District. You can be sure we received a warm welcome. 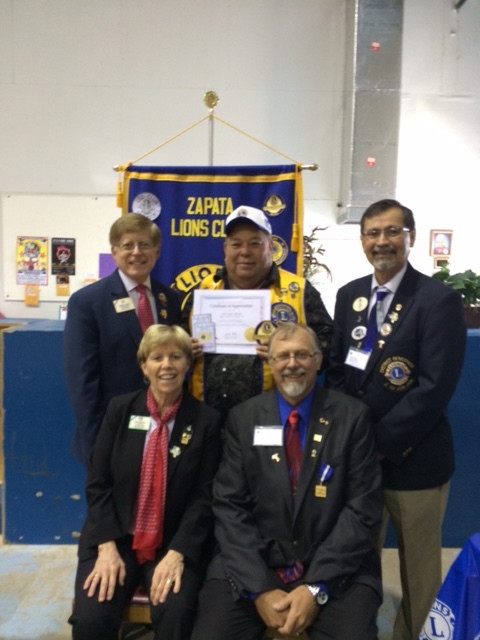 One Lion we were introduced to at the reception had a magnetic personality: Lion Aurellio Villarreal from the Zapata Lions Club. When you think of the word “mojo” and what it means, I have to say that Lion Aurellio is “mojo to the max!” His enthusiasm, can-do spirit, leadership skills, and sensitivity to all that Lionism entails made him a Lion we will never forget. Lion Aurellio (back center) proudly received recognition for himself and his club as they serve the needs of people in Zapata. The next morning, we started the day with a beautiful breakfast and a view overlooking the bay. 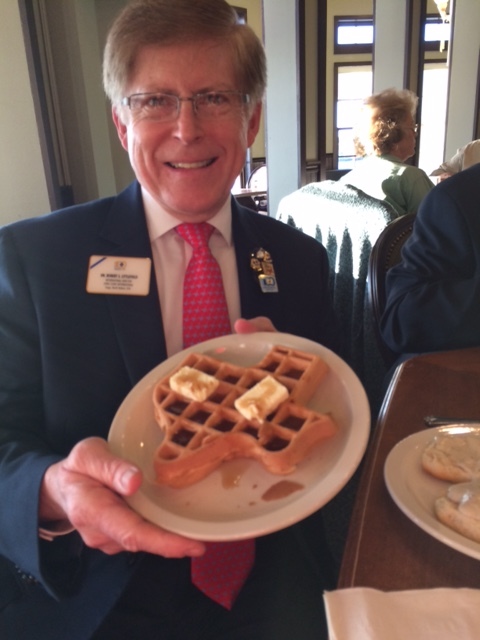 The Texas waffle was too good to pass up! Our first meeting was with the Past District Governors where I shared the message from LCI that our past leaders are a key part of our future success. They were very interested in my report on LCI Forward and the Membership 2.0 program. District Governor-elect Dave Krebbs from the Portland Lions appreciated my comments, as he revealed his plans to use the PDGs as his “brain trust” as he looked forward to next year and his term as District Governor. 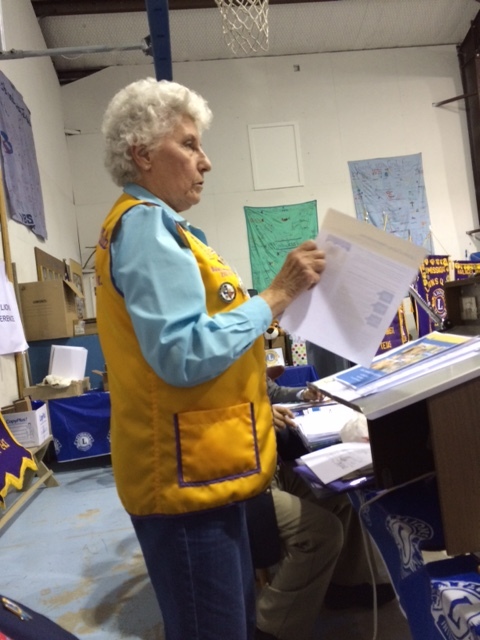 PDG Helen Muse gives her reports at the business meeting. At this meeting, we had an opportunity for the first time to see PDG Helen Muse in action. She was District Governor in 2007-2008 and it became crystal clear to us that she was and continues to be a dynamic and forward-looking leader in the District. Her work with the constitution and operating procedures and her leadership as the Centennial Coordinator for the District was impressive and it didn’t come as a surprise to us when she was later announced as the District 2-A3 inductee into the Texas Hall of Fame for 2016. PDG Enedina points to her club’s diamond patch for the Centennial Service Project. Another dynamic leader we met was Immediate PDG Enedina Vela, who had advanced membership awards and received four stars for reaching her goals during her term as District Governor. She started new clubs and continues to nurture them. She is a wonderful role model for Lion leadership. 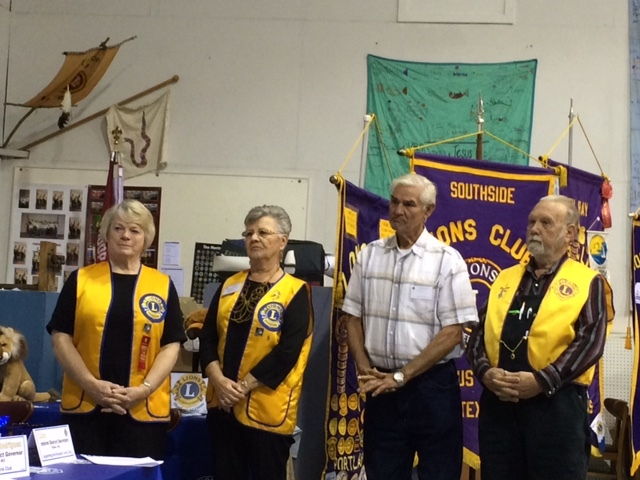 New members Lion Kathy Dauchy (far left) and Lion Ken Claypool (third from left) are inducted as Centennial New Members. I was pleased to be able to continue the tradition of inducting new members during our visits, and we raised up two more for all Lions present to celebrate. 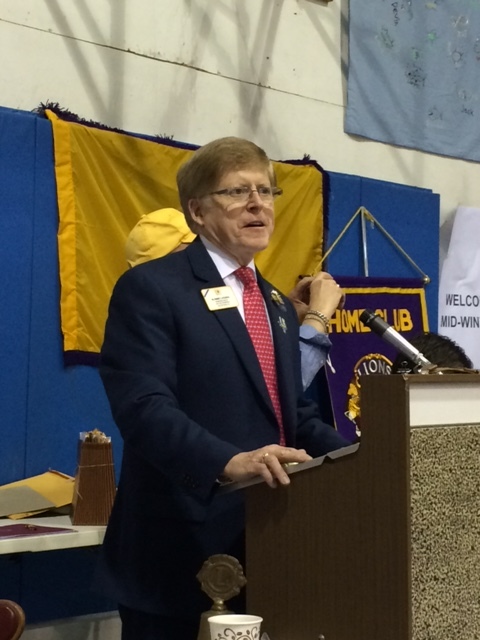 During my address, Lion Kathy provided a persuasive message about the Lions Clubs International Foundation One Shot One Life Measles Initiative. We were gratified that so many 2-A3 Lions purchased the pins so we can send a healthy donation of over US$500 to support the program from the Lions present. 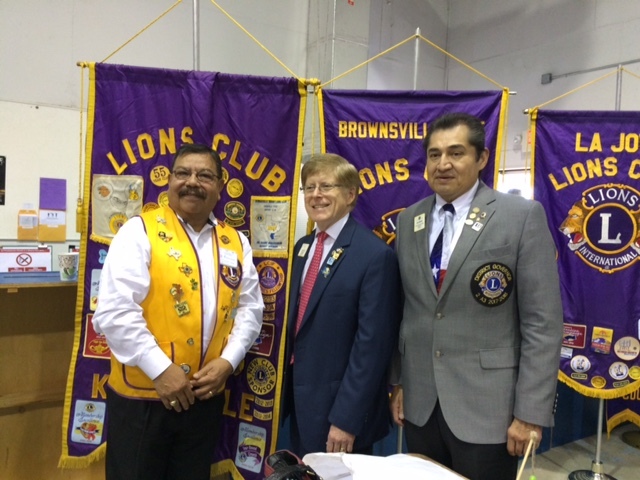 We met several Lions who had connections to North Dakota, but one in particular deserves mention—Lion Eli Escaname—from the McAllen Palm City Lions Club. He was a 1984 graduate from the pharmacy program at North Dakota State University! (Go Bison!) He provided the nominating resolution for a fellow club member—Lion Jesse Rodriguez—to become the 1st Vice District Governor in 2016-2017. The Lions of District 2-A3 were very generous with a donation in our name to LCIF, but a special gift from DG Juan that we were able to share with our family in Austin was oranges and grapefruit grown in the Rio Grande Valley. My parents loved to spend the winter months in “the valley,” and Kathy and I can see why. The generosity of the people and the beauty of the climate and culture made our visit to Texas one we will long remember. After the convention, we drove up to Austin to participate in the birthday party for our youngest grandson. Our grandsons were up and waiting at the door for us when we arrived with big smiles and hugs. Combining Lionism and family this weekend provided a perfect mix, as we look forward to our next visit—this time to our neighbors in central Minnesota. As always, best wishes to all who serve!